Provocative Proposition of the Day! 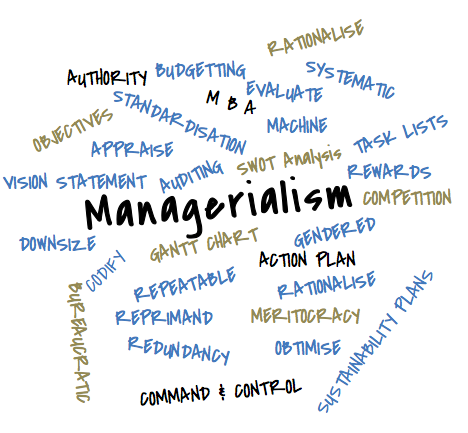 Managerialism is a truth discourse with a particular moral logic about how the world works. Through this lens, it is only trained managers/leaders who are considered able to speak that truth. In a rapidly changing ‘VUCA’ world (Volatile, Uncertain, Complex and Ambiguous), this is an out-dated concept. I believe that the key to solving VUCA problems, everybodylism rather than managerialism is needed. In this context, leadership is about helping people make sense of complexity and ‘stuckness’ by harnessing the collective intelligence of groups through collaborative conversations. Just this morning reading Barry Mason’s Towards Positions of Safe Uncertainty and wondering about links between his ideas and yours Pat? You probs know this article. Mason says that Von Foerster saw “objectivity as a device to avoid responsibility”. Mason himself talks about what he calls the “intimacy of restraint “. An idea he connects with needing to be a respectful listener who does not understand too quickly (if ever). Wonder what you think? My best wishes to you. Many thanks for taking the time to respond! It’s been some time since I read Mason’s paper but I think the link is that much of modernist managerial training is predicated on the notion that it is possible to move from safe certain to a future state that is also safe certain by using the right management technique/s. Can it? Probably in relation to first order realities, where there are prescribed solutions, e.g., in case of fire, get out. Also in second order realities where problems can be solved because there are people who know how. These puzzles can be solved through logical rationalism (IQ). However, in the case of ‘wicked’ problems presented by a VUCA world, communal sense-making is the way to go on. Hence I like the notion of moving from safe certain to safe uncertain.